Out of the 5 classes I am signed up for, 4 of the classes have a very large online component. For 3 of those classes ALL of the homework and quizzes are online. And I hate it. The ONLY upside is that for those 3 classes, the textbooks are also online. I spent $251.95 on those 3 e-books, as compared to $551 on the paper versions. I ended up spending about $500 on textbooks this semester- the 3 ebooks, 2 books that I rented from Chegg (great deal too- renting the two cost as much as buying one used! ), and 1 book that I had to buy from the bookstore (first edition and it came with a special code for online work). I am in the process of putting the ebooks on my Kindle. I get that there are a lot of advantages to doing work online- less paper wasted on turning in assignments, the teachers don't have to spend hours grading papers, etc. But I don't seem to do well with online assignments. I can complete them, and get a good grade on them, but I just don't seem to learn the material as well as when I have to write it by hand. It is going to be an interesting semester for sure. I have to spend about 12 hours at school every Monday and Wednesday. I do have breaks in between my classes so I can get homework done while I am there. Tuesdays and Thursdays I have only one class so I plan on going to school early to practice racquetball by myself. Fridays I have off! I have several recipes I am gong to try this week so I can bring the food to school. Since classes started on Tuesday, I only had to spend one 12-hour day at school this week. And I ended up going to the vending machine (Pop-tarts). I don't want to get used to getting food at school as it will get very costly, very fast. Speaking of food, I entered a recipe contest! I already submitted my recipe and now I am just waiting. The deadline is Feb. 1 and winners won't be announced until October. I plan on entering more contests as it was a lot of fun making the recipe. There is even a cash prize (not going to lie, good motivation!). I have sold 6 textbooks the last couple weeks. A little over $300 made. I am going to use the money to buy a cheap pair of boots (mine are following apart) and then put the rest in savings. That is about all for now. I am going to finish the reading and then make some lunch. My dad surprised me today by buying me a KitchenAid mixer! He said it is an early Christmas gift- so don't expect anything under the tree. Lol. I love it! We got it at Costco today. He told me we were going to do some grocery shopping and then led me to the aisle of stand mixers and food processors. I should have been suspicious- he said he wanted to replace the Cuisinart food processor he got 10 years ago (even though that thing still works perfectly). When we came to the stand mixers he said to pick one out. I got a Professional HD 475 watt, 5 quart bowl, red KitchenAid mixer. I had to lift about 7 boxes of other KitchenAid mixers to get to the color I wanted. It came with four mini prep bowls and a kitchen timer (which I really need- I have been using my cell phone alarm as a timer). There is also a mail-in rebate to get a free attachment- your choice of a food slicer/shredder or a food grinder. I am opting for the slicer/shredder. I'm so excited! I think I am going to bake some bread tomorrow using my mixer. The instruction booklet has some recipes so I might use one of those. We'll see. In other not-so-exciting news, I had to buy light bulbs today because my cat decided to pounce on a lamp, causing the lamp to fall over, and the light bulb died. I was watching her from across the room and I just knew what was going to happen before it did. Cats. I accomplished most of my goals for the weekend. I did not do a lot of studying (I still have time... the test is Thursday) and I did not do the IS quiz. Why? Because there was no IS quiz. There is not a quiz for another month and I figured I will wait to do that one until about a week before it is due. Everything else though is complete! Yay! I will be depositing about $800 into our checking today- my last paycheck at my previous work and fiance's latest paycheck. I am making spaghetti sauce as I type. Ok, technically, my crock pot is the one making the spaghetti sauce, but I am the one who mixed all the ingredients together! I decided to use canned diced tomatoes instead of buying tomatoes and dicing them myself because the canned version was a lot cheaper. Next time I will probably use fresh tomatoes. It was pretty easy and a lot more fun then buying pre-made sauce. The sauce I am making is pretty basic in flavor. Oregano, basil, and a bay leaf are all the spices I am using. Oh, and a little bit of garlic and onion. I wanted to see what this tasted like before I started experimenting with different flavors. I figured I can use this recipe as a "base" and go from there. It is (finally) beginning to get colder here. I actually need a little cardigan today. Towards the end of the week is when the temperatures will start to really drop. Our stove REALLY heats up the apartment every time we use it so I don't think we will have to run the heater a lot this winter. I have been so busy this past week and a half with school and work and family... I've been popping in and out, reading a post here and there, or reading a thread. Last week I did try a new recipe, but it wasn't from any of the cookbooks. It didn't turn out too well. In fact, I hated it. Fiance insisted it didn't taste that bad but I think he was lying to me to spare my feelings. Lol. Tonight I will not be trying a new recipe, but rather a new thing. Chicken thighs with bone and skin. I have NEVER cooked chicken thighs or breasts with the bones and skins. I always buy them boneless and skinless. But, it is more economical to buy them with the bone and skin still on. We'll see how it turns out. I've seen cooks add herbs and spices underneath the skin so I think I will try that. School is going well. Info Systems is really boring but really easy. I really like my accounting class. The only class I don't like is probability theory. It is challenging, which I like, but I don't like probability. Which is a bummer because several people have told me to consider becoming an actuary. Fiance and I are doing well with not spending a lot of money. We went to sushi over the weekend and got all you can eat for $30 for the two of us for dinner. We even got a coupon for the next time we go. But we both agree we won't be eating out again this month. I will be sticking to Walmart to do my grocery shopping. Last week I went to a different grocery store that my friend said is really good and not expensive and ended up spending a little over $50! I got the same items I usually get at Walmart. So I'll be doing my shopping at Walmart for groceries, with the possible exception of fruit. Sometimes the Walmart here doesn't have the best fruit so I'll go to another grocery store (same shopping center) for that if I need to. So far my half.com total for this month is $21. Not bad. I think that is all so far... it seems so little to update on for the past week. Thank goodness it is a three-day weekend! Fiance is getting paid Monday and I was technically paid today. Today was payday but I didn't pick up my paycheck as I will be working on Sunday and can get my paycheck then. Tomorrow should be interesting. A friend of mine, who I thought was married but is actually engaged (really long story), invited her fiance to visit her this weekend and I get to meet him tomorrow! I'm really excited. He sounds like a nice guy (but of course, he hasn't gotten my stamp of approval yet. :P). Actually, both my fiance and I will be meeting her fiance tomorrow. We haven't decided what to do tomorrow. She was thinking of going out to dinner (fiance works until 6pm), but that's not feasible for us and I don't want her to pay for us. If she wants dinner, I'd be happy to cook for the four of us. Fiance loves to eat breaded fish. We ran out of bread crumbs today (guess what he had for lunch) so I was going to buy some when I go grocery shopping on Sunday. But then an idea came to me. Walmart sells a loaf of French bread for $1.42 (about $2 less than regular sliced bread). I normally get one a week. But why not buy another loaf this week and use that for bread crumbs? It will be cheaper than buying a box of breadcrumbs and I will probably get the same amount, maybe even more. And later on, if I get good at cooking and baking, I can make the bread myself! I found this website, I think it is called moviewatchlist or something. You pay a small fee and can watch movies that come out in theaters. I'm not sure if you pay per movie or if you pay per month/year. Seems like a good idea. You can download the movies to your computer and watch them from home instead of going to the theaters. I read somewhere that it takes 60 days to make something a habit and 6 months to make something a lifelong habit. I was a little surprised by that but it makes sense once I thought about it. I started out so strong with my cooking adventure. I sat down religiously and planned out meals, searching for new recipes. And then things began to wane (probably just shy of the two-month mark). But it really fell apart when fiance and I moved into our new place. Unfortunately, we just don't have the money to constantly be trying new and "exotic" recipes. For awhile I shelved my cookbooks and recipe planning. But I have been inspired by my two new cookbooks to start again! In a smaller dose this time. My goal is to try one new recipe a week. Something I haven't tried before. Nothing really expensive- no lamb or three course meal here, but something nice that is still fairly inexpensive. And I will be sure to make extra so fiance and I can take it to school so we won't be tempted to buy something there. I'm going to make it a little more interesting. The recipe I pick has to come from a different section of the cookbook. For instance, one week I might make something from the dessert section, so the next I might make a dish from the breakfast section. I haven't decided if I am going to go cookbook by cookbook (do a recipe from each section of one cookbook before moving on to another cookbook) or if I will skip between cookbooks. We'll see. To hold myself accountable, I will take pictures of the finished meal. Probably of the cooking process too. I am also going to set a day of the week to do the new recipe: Tuesday. Wednesday is fiance's longest day at school (from 9 am to 8 pm) so he can take "fresh" leftovers to school the next day and not buy something there. I'm also doing this partly to curb my sudden desire for more cookbooks. I just got two and haven't even tried any recipes from them and I want more! They are addicting. I'm really starting to enjoy cooking. It is fun- a lot more fun than I used to give it credit for. Boyfriend and I start to move in on Wednesday (I can't believe it is so soon!) and I want to make sure we have some things in the pantry before we move in officially. So, how do I start a well stocked pantry? When I moved into my dad's, I didn't have to worry about that. My dad has pretty much everything you could ask for. All I needed to do was to keep it stocked. I have a list of items I would like to get to get us started but I feel like I'm missing stuff. Any thoughts? That's all I can think right now. These are the items I've used the most frequently over the past couple months but I plan on trying a bunch of new recipes (and making some of my own!). I'm just not sure what else I need. I would like all the items in my pantry to be able to be used in several recipes, not just a few specific ones. 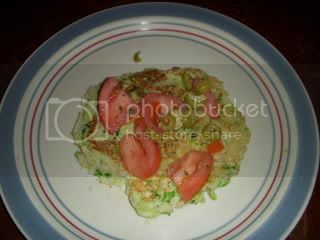 I tried a new recipe today: Potato-Zucchini skillet pancake. It called for a cup of shredded onion and I must say: my eyes! Aaagh! My eyes burned and watered like you would not believe. The recipe turned out ok- it was an interesting taste. I didn't have enough potatoes (it called for 3 cups, I only had 2 cups) though. Boyfriend really liked it, brother did not, and I'm on the fence. It was alright but I don't feel really strong about it either way. I don't think I will be making the recipe often though- mostly because I don't like it enough to want to shred more potatoes, zucchinis, and onions. The recipe is linked in my dinner menus page if you want to see it. I'm not worried, are you? I got to school a little yearly and talked to a couple friends while we were waiting for the class to begin. The subject turned to the Mexican Swine Flu. One girl thinks it is man-made and a result of bio-terrorism. She launched into a big conspiracy theory about it. I didn't pay much attention to the theory but I don't believe it. I think this will pass as long as everyone is cautious and washes their hands properly, etc. So I went to the grocery store today. I spent a whopping $142! But I went to two stores- Walmart for everything but chicken and salmon and a second store for the chicken and salmon. The salmon cost $20! I wonder if I should start getting that at Walmart. The Walmart near me sells good produce and meats, but the salmon today didn't look great. The second store is a lot more expensive, but their seafood looked more reliable. I learned a lesson today in reading the product label thoroughly. I wanted to buy avocado for sandwiches but didn't want to buy a whole avocado- I just wanted the inside (does that make sense?). So while looking in the produce section, I saw this container that said "Avocado" so I grabbed it. I got home and discovered that it is Avocado veggie dip. It tastes weird on sandwiches but really good on crackers. I guess I broke even. I'm going to try a new recipe tonight. It is this: http://recipes.pauladeen.com/index.php/recipes/view/apple_an.... It looks easy to make, but I'm not sure how it will taste. But it is always good to try new things, right? My online payment to my CC went through just fine. I'm glad I figured out online bill pay. It will become very useful. I've seen a few others do this and would like to jump on the band wagon. I created a page that will keep track of dinner ideas. I've always been a pretty good eater- I never ate a lot of junk or unhealthy food but I know there is room for improvement. So I'm hoping to be more accountable for what I eat. Plus, it will help me organize my grocery list. I created the dinner ideas for next week. Each Saturday or Sunday I will add the dinner ideas for the following week (week for me begins on Monday). I will probably keep up the previous weeks' dinners. I am only keeping track of dinners for a few reasons. One, breakfast usually is cereal or bagels and the three of us don't have breakfast at the same time. Two, lunch is also eaten at different times. My brother eats at school, I usually wait until after my classes to have lunch (usually a sandwich and a light snack), and my boyfriend brings lunch to school. None of us eats a large lunch so that accounts for a small portion of the food budget. We eat larger breakfasts and dinners. I bought a small carpet cleaner today because I was tired of having small spots on the carpet. The carpet spray that we have isn't working well and I wanted to get rid of the spots. I got a lot of the stains out, but I think I also created some stains when I accidently spilled the dirty water on the floor. And this is why they tell you to open it over a sink. We had to take one of my kitties (the one who was in the dryer some posts back) to the vet today. She has been throwing up the past few weeks so I made an appointment to have her see the vet (actually, this throwing up is the reason I bought the carpet cleaner- she threw up today and the spray didn't get it all out). The vet did some blood tests and said one of her white blood cell counts was a little high. He thinks it might be an anti-inflammatory infection.. so he gave her a shot and told us to call in a week. Vet visit was $200 but well worth it. Do you think cats need to be in a pet carrier when traveling short distances in the car? I don't have a pet carrier for my cats. The vet is a ten minute drive from my place and that's the farthest they go in the car. Both cats stay relatively still while in the car. They sit on the passenger seat (sometimes in the lap of my passenger) and meow at me. They don't like to move around the car. At the vet today, while waiting in the lobby, my cat sat in my lap and looked at the other animals. The vet staff didn't care that she wasn't in a carrier but one lady made a rather rude comment about it. My cat wasn't bothering anyone and wasn't climbing on the furniture. I guess I don't see what the big deal is. I work on Sunday. It doesn't sound like it will be a long party though. I am crossing my fingers that next week is busier. I tried a few new recipes last week. Most turned out pretty good but I didn't cook the salmon right the first time. Oh well. I'll try the recipe again in a couple weeks when I go through the rest of recipes I want to try. The other week I bought a video game called "Wedding Designer" for the Nintendo DS. It is a really stupid game. I can't bring it back because I bought it new (I know, I know) so I will sell it on half.com. I hope I can get a good price for it.